Well, everyone. It's back! We've got a new minecraft server for the FUS community, and everyone here is invited to join! We also have a chat server on a new chat service called Discord. It's free, and so far it's worked really well. Even if you can't talk on the chat, I'd advise you to tune in anyway so you can listen in on what everyone else is saying. Trust me, if one of us sees a creeper coming your way, you'll want to hear us shouting your name. And while Discord may work in the browser, I'd advise you to get the client. Works very well. Also, we plan on having special minecraft events, usually on Saturdays. This Saturday, we're kicking things off with a bang. Quite literally. We'll be playing a lovely little map called "The Minelight Zone". RSVP on this thread if you plan to join. I'll let you know the time later this week. Hope to see you there! Thanks for downloading The Minelight Zone. Escape the sinister "MinelightZone" in this chalenging map that blurs the line between an adventure and survival map. 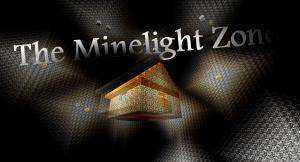 You have been mysteriously transported to the MinelightZone. How and why you got there you may never know. All that is important is how you will escape this dangerous place. Use your minecraft skills to survive this non-linear adventure map. There are a variety of strategies to use, and resources placed throughout the map. Work carefully you will make it. If you are looking for an adventure/survival challenge map, this is the map for you! Play time is entirely dependent on skill, and can vary from as short as ten min to over two hours. This map gives you the full power of survival mode. Break blocks, craft, and build your way out. DO NOT PLAY ON PEACEFULL. (Easy is fine) Don't use cheats or mods, and be sure your void-fog isn't disabled. Was that the one with the ghasts trying to kill us? I started it up. I made a house. Nobody was on except Bakuda briefly so after a while I got bored. Might join in at some point. Ooh...I liked your underwater lair. Well, there's plenty of water to build under. Our town is on the coastline. Sorry you got bored, Arek. Like I said, at this point it's hit or miss. Hopefully we can build it up and get enough people on to make it more fun. I'm back on today, gonna finish my house and hopefully get to the real portion of the game. We'll be starting at 6:00 Pacific time. So that's 8:00 for me and everyone else central and 9:00 for you Easterners. In order to participate tonight, you'll need to run Minecraft version 1.7.10. The current version of minecraft breaks the map. Well..built our automated rail maker...Works awesome. Yes, that's our Discord server. I was the one you were chatting with earlier. Clicking "claim account" should have popped up a box for you to provide an email and password. If not, there's a gear in the lower left hand corner of the screen, just to the right of the headphones button. It brings up your user settings. Click that and it'll bring up the box for you to claim your account. If you're still having problems, let me know. yeah that part worked and I could enter my info but that was it no other buttons or anything. I'll be on sometime soon.